Ken Armstrong Writing Stuff: I Got Your Letter… What Does it Say? People say lots of things about me. Different things. I just know they do. But one thing everybody seems to agree on is that I have truly God-Awful handwriting. This wasn’t always the case. My ‘starting secondary school’ joined-up writing was actually quite neat and small and spidery. I used to average fourteen words to the line and hard-pressed teachers used to plead with me to write a bit bigger. Granted, I always had that left-handed problem of dragging my little finger over what I had just written and thus tending to smudge a bit. But that was no big deal – the worst effect was that I would always have a blue stain on the outside knuckle of my left pinkie. There are worse things in the world. It all went wrong when I started Technical Drawing in school. There was a requirement to be able to write things in neat precise block capitals and I took to this quite well. Unfortunately, this block capital usage started to seep into my normal everyday writing too. Couple this with the fact that I write very fast and that was it. 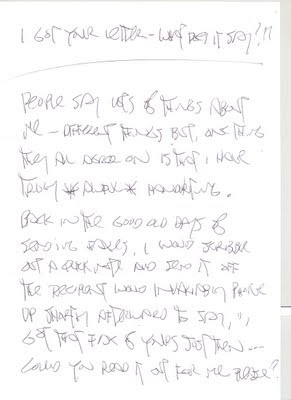 Over the years, my handwriting has become a rubbish amalgam of block capitals and joined up writing which most normal people have great difficulty in deciphering. Mostly, like everyone else now, I tend to type stuff out so handwriting is no longer the huge issue it used to be. But if I am required to fill in a form or something, I have to settle down and really focus on producing something presentable. I can so it but, my gosh, it requires concentration. Sometimes, if I have what I reckon is a good idea, I write it down. I do it really quickly in case I get bored before I’m finished and then, as often as not, I forget entirely about it. For this reason, I can often be seen scowling into my wee notebook as if it is the bloody Rosetta Stone or something. Even I can’t read my own writing sometimes. Anyway, I’ve told you now – I have bad handwriting – it’s another piece in the puzzle. I scribbled something out for a lady once, not realising that she was a professional handwriting analyst. She became quite agitated and, in truth, a bit over-excited. I think she reckoned that she had finally found the Holy Grail of Mad Handwriting and I could see in her eyes that she had every intention of locking me up in a cage and feeding me scraps of things to copy out for her. I managed to make my escape just as she began to explain to me what all my scriptural foibles and eccentricities actually meant. I really don’t want to know, thanks all the same. As I vanished over the horizon, she did shout after me that I had a decidedly Red Aura. Graphology must be a dying art I would have thought. I guess it’s only a matter of time. I’ve often wondered what a graphologist would make of my handwriting as I write with ruler. I didn’t always. 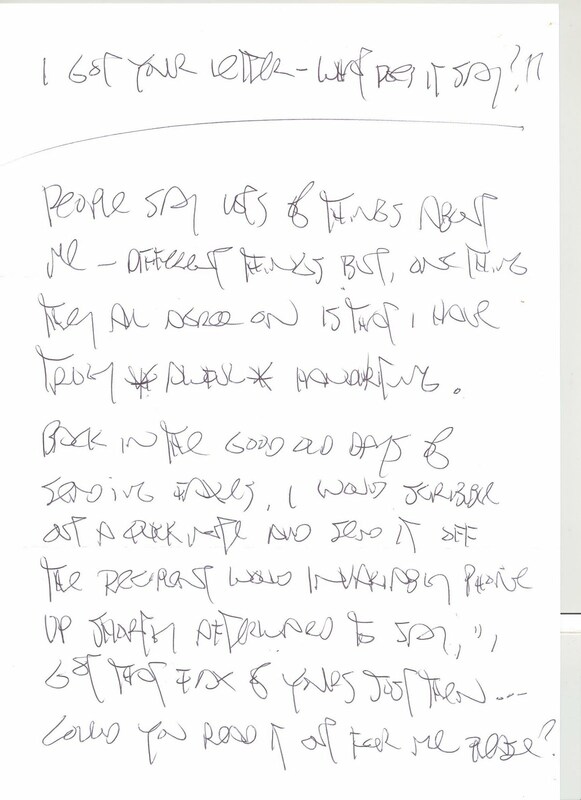 I started it when I was working in the civil service and noticed my handwriting begin to degenerate. The first think I did was buy a load of fountain pens and teach myself calligraphy. Then I added the ruler and developed quite an interesting style. After a while I dropped the fountain pens but kept the technique and I’ve been complimented on my handwriting a number of times. To do a good job over it takes time – I, like you, hate filling in forms and once I even recreated a form in Word so I didn’t have to fill it in by hand (I also wanted to show off my skills in that area). I don’t write much by hand at all these days. Sometimes I’ll scribble something on a pad, an idea for a poem or something, but that’s about it. And even then I invariably have a computer a few feet away so I tend to use them even for wee notes. almost like an assassin Tsquare polished setsquares edges fine also polished I always admired his dedication Anyway moving on Ishare your mix of handwriting styleslower case caps block caps and Sister Jacintas'joined up writing all merge in a glorious stew IT began to start in the 'tech' and just developed.13 years ago Iresat the leaving just to prove a point to myself.It was the first year you could see your test scripts so my friend and tutor Kathy encouraged to see them .Ilost 10 points on enlish and history for neatness!! If a handwriting analyst saw mine I'm sure they would assume I hadn't advanced beyond the age of 8. Thank goodness for the computer.